Hand dyed superb quality ombre tights. Smooth transaction, item EXACTLY as described!! Have gotten multiple compliments, thank you!! My daughter loved them and gets compliments every time she wears them. Very interesting and nice tights! Thanks! Thank you very much, they’re perfect! Great socks, good quality. Love the change of colors. These are exactly what I wanted. Good quality fabric and as per picture. Arrived exactly 2 weeks after being shipped. These made one of the best Christmas presents ever for my mom. She absolutely loves them and they look smashing on her. I think I created a monster—she wants a pair of the dark blue-black as soon as they are available in her size. They arrived much faster than originally quoted. There was nothing not five stars about this transaction. I’m so glad I found these! I love how original they are. I was surprise how short they were (under the bellybutton). I’m wondering if that’s intended or if the size chart is quite right (5″4, 110 lbs = size 2). 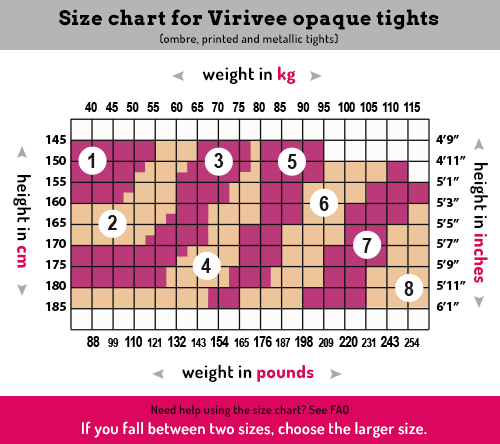 The tights suits me, but I feel that I would have been more comfortable with size 3. I love my new tights! They shipped on time, were sized perfectly and are very true to the picture. Thanks so much for a marvelous and uniquely made product. These are perfect, and are exactly what I was looking for. I am on the heavier side, and they look great still! These are beautiful. Shipped quickly and are of very high quality. I get lots of compliments on them. Thank you! Wonderful product ! This tights are beautiful, well made and of a very good quality ! The gradient color is lovely and absolutly original to wear with black clothes ! Very fast delivery in a cute packaging !